The city was full of celebration today, from tall ships to marching parades. 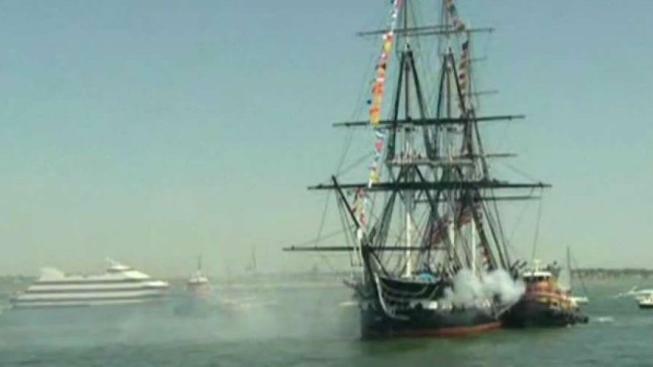 The USS Constitution left the Charlestown Navy Yard Wednesday morning for its annual Fourth of July voyage after sitting out the last several years. The world's oldest commissioned warship still afloat made its traditional trip to Castle Island, where it fired a 21-gun salute off Castle Island. The Constitution then turned around and returned to the Charlestown Navy Yard. The event marks the ship's first holiday spectacle since returning to the water from its three-year restoration project. Last year, the Constitution missed its annual Fourth of July trip into Boston Harbor because it was in dry dock following the major overhaul. Elsewhere in Boston, other celebrations for the Fourth of July were underway. The annual Independence Day parade stepped off from Boston City Hall this morning - making its way through streets older than the republic itself. The Declaration of Independence was also read from the balcony of the old Massachusetts Statehouse, just like it was first done when the British still ruled Boston. But the holiday also served as a reminder of the importance of this country's democratic institutions and history as a place of refuge for people escaping persecution -- particularly at a time when there are increasing concerns being voiced about President Trump's shoot-from-the-hip decision-making and anti-immigrant rhetoric. "People came here for different reasons because they were oppressed in their country. They couldn’t celebrate religious freedoms and they came here for different reasons and they created this country and it seems like we’re going backwards a bit here,” Boston mayor Marty Walsh told NBC10 Boston during an interview at a parade.